Foreigners, especially from Mediterranean and West European countries, have resided in Beyoğlu for long time. There is a cosmopolitan atmosphere in the heart of the district, where people from various cultures live in Cihangir and Gümüşsuyu. Beyoğlu also has a number of historical restaurants. Beyoglu is the one of the important center for culinary culture of the city. The tour will start with Turkish style breakfast and continue with walking through fish markets, exploring pubs and bars, tasting Turkish drinks and visiting French town. Finding kebap restaurant in Istanbul is not hard; there must be thousands, but finding the right kind of place can be surprisingly difficult. The most famous kebab and local restaurants will be visited during the tour. We will walk on the back streets of Beyoglu and explore the culinary atmosphere. We will finish the tour in Karakoy Gulluoglu with the small sips of Turkish tea in tulip shape glass and desserts of Gulluoglu like bride bundle (gelin bohcasi). In old town there will be a lot of places to visit for culinary, where the personel is trying to make one come inside. There is really a kind of competition between the restaurants to make one come inside. However, the best restaurants are not always the expensive tourist restaurants, but those small Lokantas where even the Turkish people go for having dinner. Belros Tourism Agency organizes full day ‘’secret of old city ‘’ Sultanahmet culinary tours to explore traditional tastes. 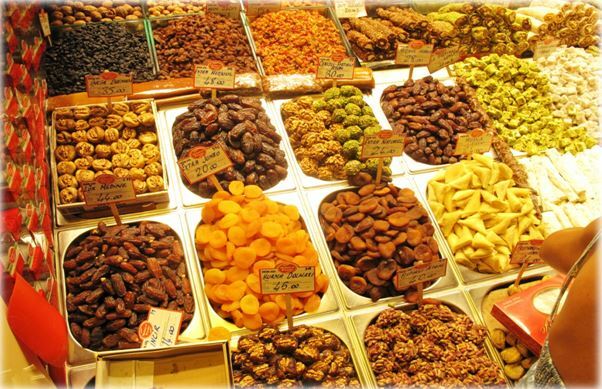 In addition to our “Street Foods Walking Tour”, we offer small-group tours to, Sırkeci, Eminonu, Kumkapi, Ahirkapi and other areas to see places like Fish Market and Spice Market. We will visit local restaurants and continue with the seafood restaurants to taste typical mezes of Turkish, Armenian and Greek kitchen. We will continue with gaucho kebaps from Erzurum and finish the day by tasting some Turkish deserts like baklava and Turkish coffee. Ottoman and Turkish cuisine will be explored during the day. Special choices for vegetarians will be available as well. The tour will start with the special Ottoman & Turkish breakfast in a restaurant with the amazing Bosphorus view and continue with the beautiful atmosphere of the Istanbul by tasting local specialties and drinks like boza and palace sherbet. During the tour our guests will have chance to taste favorite dishes of Fatih sultan Mehmet and Sultan Abdulhamit II. Some of the oldest local food shops and bazaars are included in our program. We will finish the tour in the oldest Turkish delight shop of the town since 1777. Lokum is known as Turkish delight and has been produced in Turkey since the 15th century, but it was in the 19th century that Haci Bekir became famous in the world of confectionery when the company began producing their lokum using starch and refined sugar.